Here we are at part II of my retrospective look at Cinemaware and we are off to a flying start. Rocket Ranger: This time around, Cinemaware took inspiration from 1950’s Sci-Fi serials with Rocket Ranger released in 1988. Playing on many of the clichés of that 1950’s era including a dashing, courageous hero with a beautiful, voluptuous damsel in distress. Even using the stylised futuristic predictions and visions of the time frame. The plot is set in a future where the Nazis had won World War II and were able to enslave the entire world. From that future, artifacts are teleported to you the player in the role of a US Army scientist. The future artifacts being a rocket pack and a radium pistol were sent back to you in a hope that you could reverse the outcome of the war so the Nazi army lose. The Nazis winning World War II is based on their use of a mineral named lunarium. Lunarium has the ability to lower the IQ of human males drastically, and effectively preventing military resistance when the Nazis invade. What is even more puzzling is that lunarium is only mineable on the Moon and mankind so far does not yet have the technology to reach it…so how did the Nazis get a hold of it? Like in previous Cinemaware games, this title mixes up various gameplay elements from action and strategy all with that Cinemaware, cinematic style. Using the aforementioned rocket pack and a radium pistol to become The Rocket Ranger, you would have to shoot down enemy fighters and intercept enemy shipments. Some sequences were bareknuckle fistfights with enemy Nazi guards in order to gain rocket parts, you’d even be tasked with having to disable the defenses of two available lunarium depots to get fuel for both your own rocket pack and the rocket ship you’ll need to build. Another scene had our hero catch up with a kidnapped scientist and his voluptuous daughter in a Nazi Zeppelin. In these encounters the player must engage in dialogue with them to earn their trust. The strategy part of the game comes from a world map display where you direct five US agents to search for hidden Nazi bases. These agents can also “organise resistance” to slow the Nazi’s advance towards the USA. The main goal of the game is to collect five parts to a rocket ship along with 500 units of the lunarium to get to the Moon and close down the lunarium mines to stop the Nazis winning World War II. 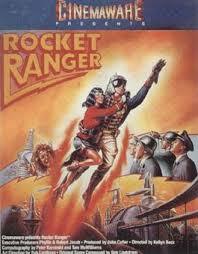 Rocket Ranger was highly praised for it’s clever mix of action and strategy and of course for that real cinematic style and tone Cinemaware had become famous for. Rocket Ranger was a sublime return to form after the rather unimpressive The Three Stooges previously. Next Cinemaware would take us East…far East. 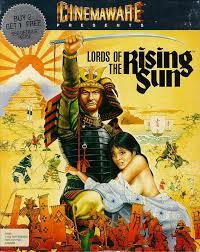 Lords of the Rising Sun: Released in 1989 Lords of the Rising Sun was very similar to Cinemaware’s earlier title: Defender of the Crown. With it’s mix of map based strategy and arcade style mini games. Drawing their inspiration from Japanese Samurai movies and even dipping into actual history. Giving you the option of playing as one of the famous real life Japanese generals of the time, Yoshitsune or Yoritomo. As you fight to pacify Japan by force set against and early feudalism in Japan backdrop. The game shared a lot with Defender of the Crown with similar sequences like fortress attacks or even defending against a Ninja assassins. If the two rival troops collided on the map, a battle would ensue in which you’ll have to use all your strategical wits to guide your men to victory. You could even negotiate alliances. All while having to build your army to slowly taking over and bring peace to Japan. Lords of the Rising Sun met with positive reviews with many admiring the game’s cinematic qualities along with the mix of action and strategy elements. But many would also highlight the fact the game was basically a re-hash of Defender of the Crown from 1986, which was not a bad thing at all. Leaving feudal Japan behind, Cinemaware would take us to a monster/B-movie world and my own personal favourite of their games. 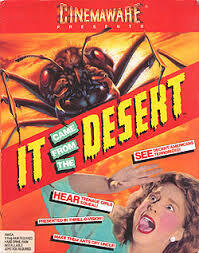 It Came from the Desert: From 1989 with giant ants aplenty in this 1950’s, Them! inspired, B-movie extravaganza. Offering a massive open and non linear world to play in and explore at will. With you playing as Dr. Greg Bradley who finds himself in the remote town of Lizard Breath, Nevada on June 1st, 1951. Dr. Greg Bradley is a geologist, who wants to study a recent site of a meteor crash somewhere south-west of Lizard Breath. Where you learn that the radiation from the meteor has enlarged a local ant population to an enormous, gigantic size. yet the townsfolk do not take your findings seriously. Realising that the ants will soon mate and spread, you must work against a ticking clock and devise a plan to stop the ants from terrorizing Lizard Breath and eventually the world. In order to succeed you must visit many and varying locations in and around Lizard Breath ranging from an airfield, the local radio station, mines, farms, a newspaper publisher, the Mayor’s office and many more to find evidence of the ants and in turn convince townsfolk and authorities of impending giant ant infestation and attack. Only by finding, understanding and using every resource available, from simple workers to the army with their tanks and fighter jets, will the player be able to take the fight to and win over the giant ants. It Came From the Desert can be considered “real-time”. Waiting, sleeping and driving around consumes time. As you only a fixed amount of 15 in-game days to succeed find the source of the ants and destroy the queen and nest, time is of the essence. If you fail to do so by this date the ants will mate and spread, which results in bad ending ending. To reach a good ending, the player must locate the ant colony and kill the queen ant. The game is really split into two varying game modes. The first being more adventure based finding and collecting clues as to the giant and problem and then trying to convince as many people as possible of your findings. You’ll also find subplots including; a romantic plot and even a mysterious murder case connected to a secret society known as “Neptune”. The second part is more action oriented with you fighting off the ants using the resources and help you have amassed over the course of the first part. It Came From the Desert was specifically designed for multiple playthroughs with your actions and reactions changing the outcome of the game in varying ways even leading to multiple endings. The nonlinear narrative comes about as it depends which location you visit and at what time, also whether you meet certain characters at locations and whether they advance their own individual stories within the main plot. Playing as Dr. Bradley you can defend yourself against the giant ants with grenades and a pistol. Later in the game, you’ll use other weapons (as long as you have convinced certain people), such as dynamite and even a flame thrower. Depending on the location, you can also drive vehicles like tanks, fly a planes and spray pesticides over the ants. You’ll even get to fly a jet if you can conceive the army of the giant ants. Chicken: At random times when you drive from one location to another. A local gang of greasers would challenge you to a game of chicken where your objective is to drive your car head-on into the approaching car of the gang members and hope they chicken out first. You can maneuver your own vehicle off the road if you wish, which results in a crash but then your car needs repairs and counts as a time penalty. If the greasers don’t evade, you will also crash and in addition are penalized with waking up in hospital. Shooting: This mini game switches to a first person perspective and Dr. Bradley can shoot his sidearm at an approaching giant ant. The ant is killed by shooting off both its antennae, but failure to do so will result in you being attacked by the giant and and waking up in hospital. Fire Extinguishing: There are scenes in which the player must wield an extinguisher to quench a fire at a building. The mechanics are fairly similar to the shooting minigame. If you fail to put out all the fire, you’ll fail, and wake up in the hospital. Knife Fight: In some encounters, when questioning an interviewee during the adventuring part, if you hit a nerve with your questions they will pull out a switchblade. Dr. Bradley and his opponent are shown from above. Where you have to evade the strikes of your opponent’s stabs and counterattack when they are exposed. As you may have guessed…losing the knife fight will put you into the hospital. Hospital: When you fail in any action sequence or mini game, you will wake up in a hospital bed (you’ll do this a lot) and you’ll have to stay there for at least a night, losing valuable and much needed time. However you can choose to escape, this is when the game switches into a top down perspective within the hospital. You are chased around the hospital by nurses and doctors. But the game allows you to hide in empty beds, under counters and others as well as commandeer a wheelchair to try to make your escape. If you successfully escape the hospital this will reduce the time penalty. It Came from the Desert met with rave reviews and rightly so. The game was pure genius. With so much game content and replay value, It Came from the Desert was Cinemaware’s opus all wrapped up in that classic and authentic cinematic style. 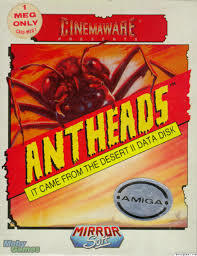 Antheads: It Came from the Desert II: Released in 1990 came this pseudo-sequel. Though labeled: It Came from the Desert II, this was not technically a sequel but an expansion that required the original game in order to play. The plot of this game takes place again in Lizard Breath but now set 5 years after the previous title and expands on the possible second ant queen mentioned in the first game’s ending (if you got that ending). This time around you play as an Army officer named Brick, who has stolen a detonator for an atomic bomb as his kid brother is a tester for the weapon and fears that the Army’s ignorance of radiation will cause his brother and other testers to die. So Brick tries to find Dr. Wells from the first game who has since died but is ambushed by surviving soldier ants who steal the detonator to rouse their dormant second queen. Brick must find Dr. Wells’ notes that prove radiation is fatal as well as help the town fend off the new ant army. As an expansion, this is really a retread of the last game with no real new features, just a slightly different story and a handful of new characters. The basics remain the same as do the mini games. So no need to cover this one in detail, just re-read the: It Came from the Desert overview up there ^^^. Antheads: It Came from the Desert II was just an expansion but still met with positive reviews. A smaller game than It Came from the Desert, but again it was just an expansion…and a bloody good one too. As we leave silliness of B-movies and giant ants behind, we hit the harshness of World War I and sadly the penultimate game from classic Cinemaware. 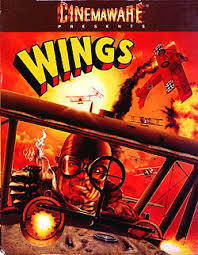 Wings: If It Came from the Desert is my favorite Cinemaware game, then Wings is a very, very close second. Released in 1990 and drawing its inspiration from World War I movies, Wings was a masterful mix great action and an atmospheric story narrative. Playing as your own named fighter pilot, or various fighter pilots if you die in game. Wings was a very narrative driven game delivering the harshness and reality of World War I. Gameplay consisted of a mixture of strafing missions, bombing missions and even 3D dogfights. While you take the war to the Hun and even go up against some of Germany’s deadly aces pilots in heart pumping dogfights. The game was much more action oriented than previous Cinemaware titles but features a much stronger and emotional story than before. Most definitely a much more serious tone and style than previous Cinemaware games but also lighter on overall gameplay elements which really gives very little to talk about. But don’t let that put you off as Wings is an amazing game, it’s just a lot more story based and playing the game delivers the emotional punch via simple journal entries of your pilot far better than I could do here…so go and play Wings. Upon release, Wings was hailed and even today remembered as one of the very best games on the Amiga for good reason. I guess I need a part III where I will do a quick overview of the Cinemaware sports games and also that Cinemaware published adventure title. This entry was posted in LBoG: Retrospectives and tagged Antheads: It Came from the Desert II, Cinemaware, Commodore Amiga, Game retrospectives, It Came from the Desert, Little bits of gaming, Lords of the Rising Sun, retro gaming, Retro gaming blog, Rocket Ranger, Wings on 06/05/2015 by Steve Perrin.